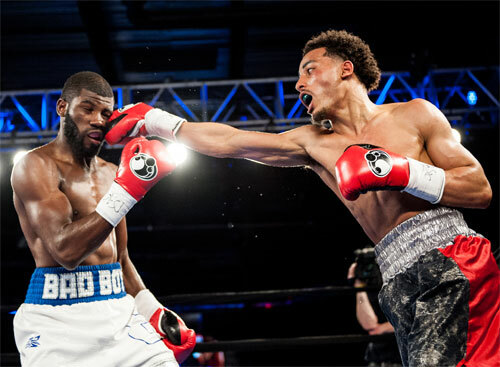 Two Philadelphia lightweights faced off for City bragging rights in the main event, Friday night at the 2300 Arena, and the result was a rousing battle. In a mild surprise, Avery Sparrow won an 8-round split decision over Anthony Burgin, in an all too rare Philly vs. Philly match up. 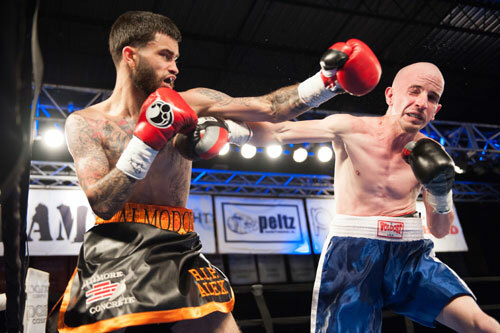 The house was packed with 1,247 local boxing fans for the 10-bout show promoted by Peltz Boxing, Joe Hand Promotions, BAM Boxing, and Raging Babe. Anyone who witnessed the initial rise of Avery Sparrow in his first four fights wouldn't have been shocked to hear that he was on track to upset a more established fighter with twice the number of bouts to his credit. 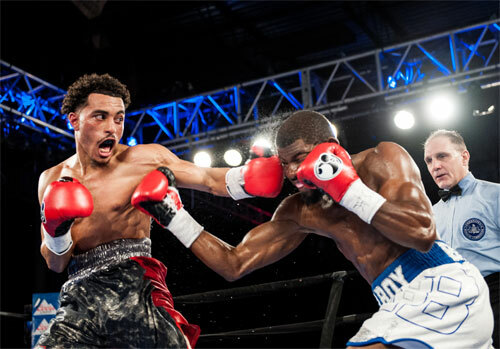 However, the jury suddenly went back out on the North Philly prospect when be blew a fight with Allentown's Jerome Rodriguez late in 2015. In that maddening performance, Sparrow fouled out after completely controlling that more-seasoned foe. Sparrow was given numerous warnings and penalized no less than three points during the course of the scheduled 6-rounder. In other words, Avery had ample warning and could have easily avoided losing the bout. However, on that night, he was determined to lose. Sparrow bounced back five months later, out of town and against an easy opponent, but had yet to prove himself to the discriminating Philly fight fans. Enter Anthony Burgin and a spotlight fight before a large local crowd. No one ever had doubted Sparrow's skills, but against the well-schooled and always-solid Burgin, it was clear that we would all get a chance to evaluate Avery's current state of mind. His fans kept their fingers crossed that he wasn't a head case, while the rest of the boxing fans just hoped that this Philly vs. Philly match would ignite, as planned by the promoters. Both of these fan bases got their wish, as the meeting between Sparrow and Burgin turned into an entertaining and very memorable fight. And to tell the truth, Burgin's supporters had plenty to be proud of as well. 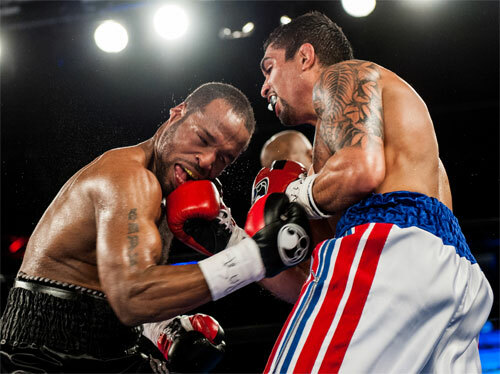 The 8-rounder heated up quickly, with both boxers offering a buffet of body punching in the first half of the fight. Sparrow was a little busier in the first round, and took it on my card, but Burgin establish himself as the aggressor by the second. Over the next couple rounds, Burgin took the lead on my card, controlling the action with a stiff jab and occasional right uppercut that caught Sparrow's attention. However, Avery fought back the whole way, ducking, dodging, zipping in and out, and tossing his own flashy punches. Sparrow came on strong at the end of the third, nearly stealing the close round. The fourth was a thrill-ride, with both fighters landing. Anthony whacked Sparrow with a hard left hook, but Sparrow responded well. The exchange ignited the fight and pushed it into the two-way confrontation everyone had hoped for. In the second half, Avery's attack bloomed, but still the rounds were closely fought. At least two of the 3-minute sessions were tough to assign to just one fighter, including the fifth. In round five, Burgin landed a number of shots, but Sparrow stole the episode on my card. Round six turned out to be critical. Almost two minutes in, Sparrow nailed Burgin with a right uppercut and the lanky boxer fell to the floor. Burgin got up, ready for more, but he looked a little shaky. Referee Gary Rosato counted to eight and allowed the fight to continue. With more than a minute remaining in the sixth, and with Burgin looking unstable, it appeared the fight could come to a close at any moment. Sparrow waded in. However, Burgin showed heart and chin and survived the round. The bell, sounding not a moment too soon, helped out Anthony greatly. Burgin landed a few good rights in the seventh, but he no longer was playing the role of aggressor. Sparrow stepped on the gas and tried to capitalize on the wounding he had administered in the prior round. But the seventh remained close and perhaps was another swing session on the scorecards. In the eighth and final round, Burgin let the punches fly, looking to salvage the close fight. He landed numerous overhand rights, a firm left hook, and a showy right uppercut before the round ended. Burgin's busy output earned Anthony the round, but there was still a question as to whom had won the fight. The official judges did not completely agree on a decision. Steve Weisfeld scored the bout 76-75 for Sparrow. Myra Grant had it 76-75 for Burgin. Judge John Poturaj broke the tie with his 77-74 score for Sparrow. My score was 76-75 in favor of Sparrow. As it turned out, the knockdown was crucial to Avery's victory. Had it not occurred, the tabulation would have been a split draw (1-1-1). With the win, Sparrow improved to 6-1, 3 KO. For this fight, Avery came with a new corner headed by Greg Hackett, a "former" fighter with one foot still lingering in the participant category. It always sounds like he'd like to take another fight, but he may have found his true calling as a trainer. Rounding out Sparrow's corner was Billy Briscoe and Danny Davis. A dream team to be sure. Burgin's narrow defeat slipped his record to 10-3, 2 KO. Although it was a loss, his performance was still a good one. So Sparrow left with the Philly bragging rights on this night, but everyone in the packed house would certainly love to see a rematch. Hopefully they will do it again soon, and hopefully, both Sparrow and Burgin inspired other Philly fighters to open their minds to more intercity ring warfare. 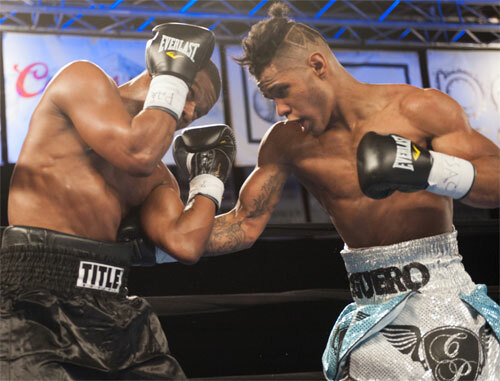 In a 6-round junior middleweight bout, Roque Zapata, Culpeper, VA, 3-1-3, continued his run as a Philly-spoiler with a unanimous decision win over North Philadelphia's Fred Jenkins Jr., 10-4, 3 KO. In his last appearance at the 2300 Arena (12/02/16), Zapata beat Isaiah Wise, issuing the South Philadelphian his first pro defeat. Zapata returned to Philly and set his sights on Fred Jr.
Jenkins started the fight well and built an early lead. Zapata quickly turned the tables and made a statement with a short right that caught Fred coming in. The punch deposited Jenkins on the canvas, and began set off the beginning of his long night. 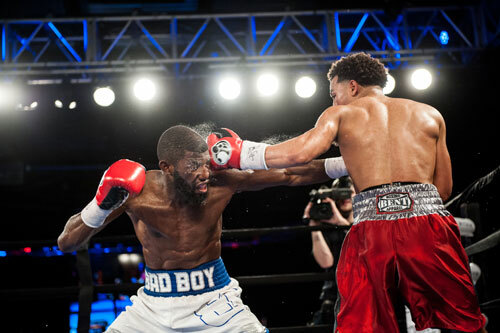 The next few rounds were back and forth with both boxers having their moments, but in general Zapata chipped away at Jenkins, even in the rounds he lost. After four rounds, I had the fight two rounds apiece, with Zapata ahead by that knockdown point. In round five, Zapata upped the pressure and nailed Fred with his hardest rights of the night. 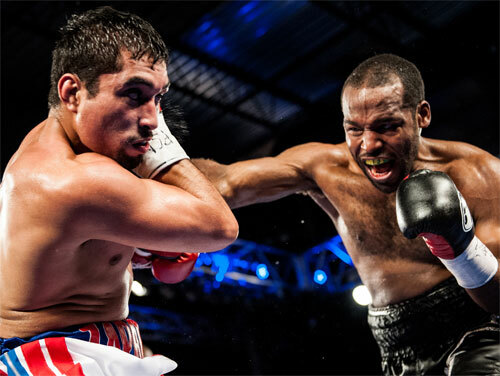 Jenkins faded as the round wound down and when the bell sounded, he wobbled back to his corner. In the final round, Zapata kept punching while Fred stood his ground. However, it was punishment Jenkins didn't need. Still he survived the round. The official scores were all for Zapata. Gail Jasper had it 57-56, and Steve Weisfeld and John Poturaj both scored it 59-54. My score was 58-55 for Zapata. Even on paper going in, this match looked like a tough one for Jenkins. 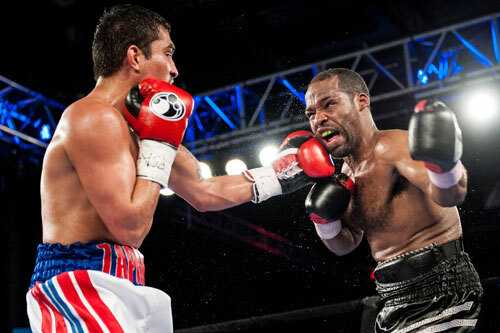 The win gives Zapata two in a row against Philly fighters at the 2300 Arena. He returns on June 2nd. So the question is, 'Who will be his next victim, or which one of our fighters can break his streak?' We'll see in a few months. 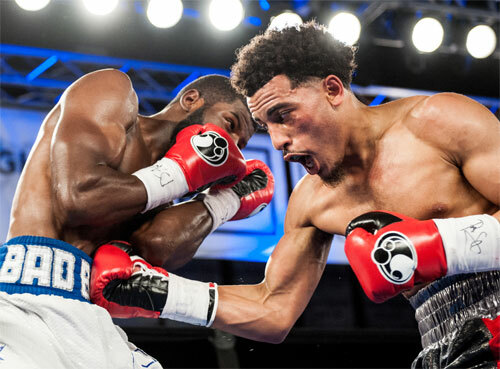 In a junior middleweight slugfest, Isaiah Wise of South Philly, 4-1, 3 KO, won by TKO in round four over tough Jeffery Wright of Milwaukee, 4-6-1, 4 KOs. However, he had to come off the floor to do it. Wright hurt Wise twice in round one, but the local weathered the storm and took the round with a busier three minutes. 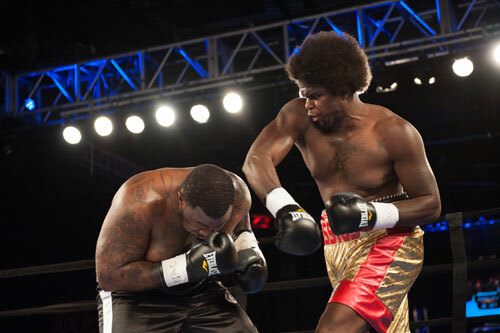 However, in the second round, Wright was back, and dropped Wise with a hard right. Wise looked hurt, but made it to his feet and didn't give up. In the following round, Wise flipped the script on Wright, and put him on the canvas with a right to the body. 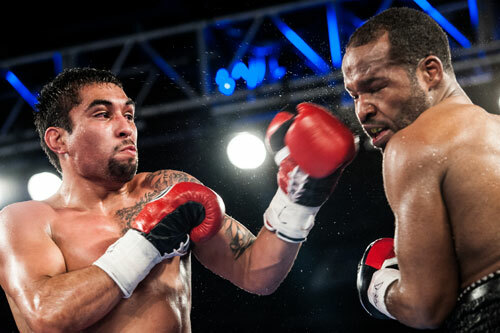 Wise also landed a heavy right to the head and later, a left uppercut further softened his dangerous opponent. 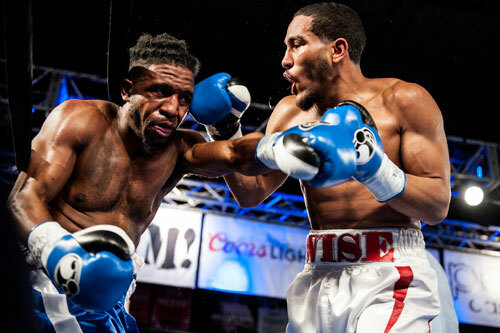 Wise jumped out in the fourth round, clearly with ending the fight on his mind. Isaiah landed a right to the head that sent Wright down along the ropes. Jeffery made it to his feet and seemed to convince referee Gary Rosato that he was able to continue. Rosato waved Wise back in, but then suddenly stopped the fight after Wright too his fist step away from the ropes. The time of the stoppage was 32 seconds of round four of the scheduled 6-rounder. Jersey-based Puerto Rican Victor Padilla, 3-0, 3 KOs, knocked down Tuscon's Carlos Castillo, 4-5, 3 KOs, en route to a 48 second TKO. The game Castillo somehow jumped up after both trips to the canvas, and appeared ready to fight on. 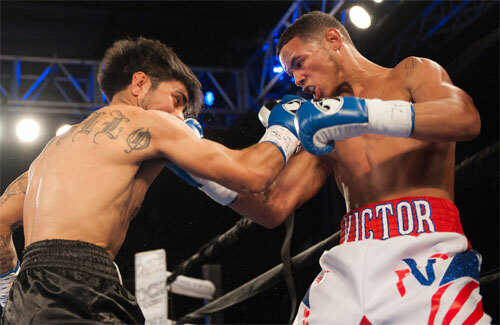 However, referee Blair Talmadge halted the bout to save Castillo from further punishment. With the win Padilla continued his impressive rookie season. 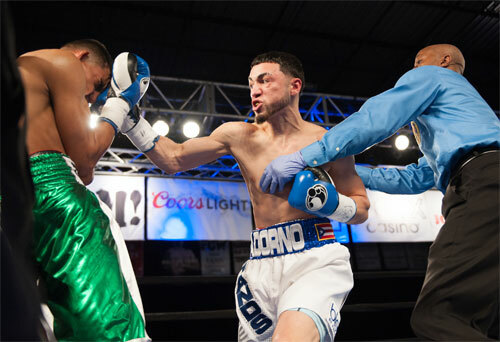 Allentown, PA junior lightweight Joseph Adorno, 3-0, 3 KOs, stopped Mexican Marco Ocano, 1-1, 1 KO, at 45 seconds of the first round. Adorno stunned Ocano with a hard right and kept throwing punches until referee Ronald Bashir jumped in to stop it. Adorno, like Padilla, looks like a sure bet. In a 4-rounder between two NE Philly flyweights making their pro debut, Ernesto Almodovar, 1-0, dropped southpaw Steven Lopez, 0-1, in round one and went on to take the unanimous decision by scores of 40-35 and 39-36 twice. 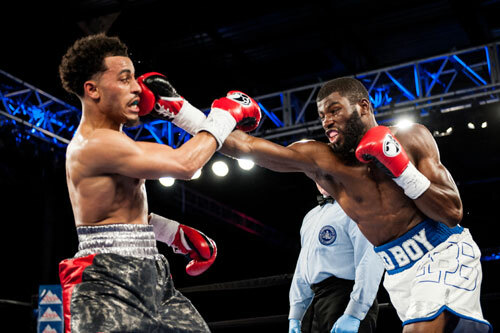 West Philly-born heavyweight, Cassius Chaney extended his undefeated streak to 9-0, 5 KOs, with a 6-round majority decision over Lansing, MI's Tom Washington Jr., 6-10-1, 2KOs. Although there was no doubt about the outcome, Chaney did nothing to excite, or even interest, boxing fans on this night. The scores were 57-57 and 59-55 twice. In the crowd-pleasing flyweight bout that opened the show, Kyrgyzstan native, Basyzbek Baratov, now based in Northeast Philadelphia, made his local debut with an exciting points victory over North Philly's Tyrone Arzeno. It took Bartov about one minute to warm up, but once he did, he was trouble for Arzeno. Bartov kept coming and kept punching, but Arzeno made it a two-way fight. 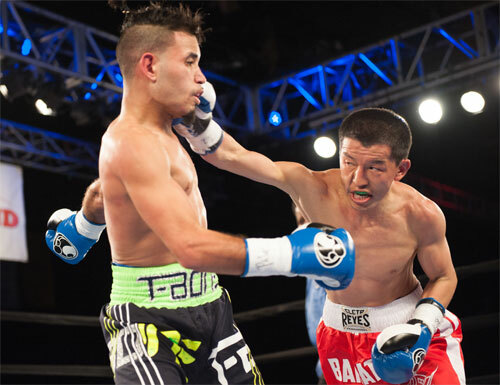 He landed on Bartov in rounds three and four, but still dropped his professional debut by split decision. Judge John Poturaj favored Arzeno 39-37, while Myra Grant and Gail Jasper scored the 4-rounder for Baratov 39-37. My score also favored Baratov 39-37. In the first of two walkout bouts after the main event, junior featherweight Crystian Pequero, NE Philly, 1-0, 1 KO, knocked out Alonso Davis, West Philly, 0-1, with a right hand body shot at 2:12 of round three of a scheduled 4-rounder. The referee was Blair Talmadge. Both fighters were making their debut. In a 4-round super middleweight bout, Chris Thomas of Beechwood, NJ, 5-0, 2 KOs, (white trunks above) remained undefeated with a unanimous points win over Mike Rodriguez, of Springfield, MA, 0-4. Rodriquez lost a point for holding in the second, and Thomas won by scores of 39-36 (Gail Jasper) and 40-35 twice (John Poturaj and Myra Grant). My score also was 40-35 for Thomas. Peltz Boxing returns with another show at the 2300 Arena on June 2nd.